Shashwat Deepali Nagar came to Georgia Tech after earning a Bachelor of Engineering in Biotechnology from Netaji Subhas Institute of Technology (NSIT), University of Delhi, in New Delhi, India. As an undergrad, he learned how to do research by working in the Computational and Structural Biology Laboratory at NSIT. In his spare time, Shashwat was president of the NSIT Quiz Club and enjoyed participating in quiz competitions in all over India. 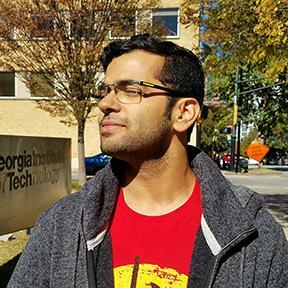 “Georgia Tech has a great academic reputation around the world,” Shashwat says. “The cutting-edge and impressive research being done in the Georgia Tech Bioinformatics Program is what attracted me. Additionally, Georgia Tech is a premier institute for computer science, making it ideal for someone like me who wanted to work at the interface of biology and computer science." Nagar is graduating with a Master of Science in Bioinformatics. To manage my time and effectively working in large groups. Georgia Tech lived up to my expectations. The instructors, peer group, and level of rigor were as spectacular as I had hoped for. I was pleasantly surprised by how much individual attention professors were willing to give each student. One would not expect this at a school as big as Tech. My mentors and professors have been approachable and available throughout my time here. It really makes the graduate experience significantly better. I hope this continues for future students. Professor I. King Jordan had the largest impact on me. He had been my mentor and principal investigator (PI) for the past three semesters, and I couldn’t have asked for anyone better. He has been patient with me when I was not at my best, has been a dynamic and responsive PI for all my research projects, and he has always tried to bring out the best in me. I am honored to have worked with him and hope to be able to continue working with him in the future. The first finals week – the immense pressure and the delight of midnight breakfast! It was a new experience for me and one that I will not forget. In summer 2017, I interned in the Department of Health Science Research at Mayo Clinic. The experience was invaluable. It gave me a taste of what it is to be in the working world and a great opportunity to apply the skills I had developed over two semesters in the Georgia Tech Bioinformatics Program. Start managing your time from day 1. Procrastinating will land you in delayed submissions and a sink full of dirty dishes. I plan on working with ABiL, a bioinformatics consulting firm starting next year. It will be a great way to apply all that I have learned in the Georgia Tech Bioinformatics Program. After gaining some experience, I would like to start working toward a Ph.D., which would help me round-out my skill set and become a better researcher.